I took a visiting friend from Germany to Acushnet in order to experience a true New England Autumn and we discovered the beautiful and lovingly run Stone Bridge Farm. On the very last day that tours were offered for the season, Joanne and Scott, the hard working and dedicated owners of Stone Bridge Farm, were extremely friendly and knowledgeable about the process of cranberry harvesting. My friend and I had a great time wading around taking pictures in the bog after hearing about the history of the Harding family and their cranberry legacy. As a nearby Plymouth native, I am familiar with all things cranberry but have not experienced anything as enjoyable as this. We did not pick our own cranberries, but our farm tour and cranberry "photo op" came with a free pound of them, and I also purchased a jar of their honey and have been enjoying it in my tea ever since. What I like most about Stone Bridge Farm is their sense of community- the family runs a summer farmer's market to encourage buying local and supporting the town, and I'll be sure to be the first in line to enjoy the fruits of their labor once they open next season! My wife and I visited Stone Bridge Farm after we found out they offered PYO cranberries; most farms don't offer it. They also had a "picture yourself at a cranberry harvest" which was a ton of fun and very reasonably priced. They took numerous photos of us doing different poses in their wet bog. It was great to share them with friends and family on Facebook and as a Thanksgiving card through Shutterfly. The owners, Joanne and Scott, are the most friendly people in all of Cape Cod! No joke. We learned all about the lifecycle of cranberries and how they are harvested. After the photos we picked about 12 lbs of cranberries (buckets were provided), then bought some of their local honey, which has a lovely cranberry blossom flavor, and a t-shirt. The farm was easy to find using GPS and is only about an hour from Boston. We will most definitely visit again next year when the plants blossom and again during harvest. We just love supporting local farmers! Go, go, go... Take the family and create your own memorable Cape Cod experience. Part of the beauty of New England comes every October. Not the changing of the leaves (but that's pretty awesome, too) but the ruby seas that pop up all over the place. 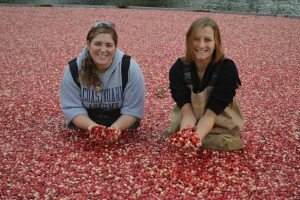 Cranberry harvest time (specifically wet-picking) is iconic New England. Thanks to Stone Bridge Farm, those guys in the Ocean Spray commercials no longer get all the fun!!! You won't believe how much fun it is to get into the waders and play in the bog! Also, you can dry pick your own berries! Such a fun way to enjoy the fall beauty of Massachusetts! Stone Bridge Farm from Devlo Media on Vimeo.